These infant swings will keep your baby happy, healthy and thoroughly entertained while you go on with your regular duties. The swings are more comfortable than lying down or sitting and they substitute the need to rock the baby to sleep. They also give babies their much-needed exercise, not to mention thorough enjoyment. 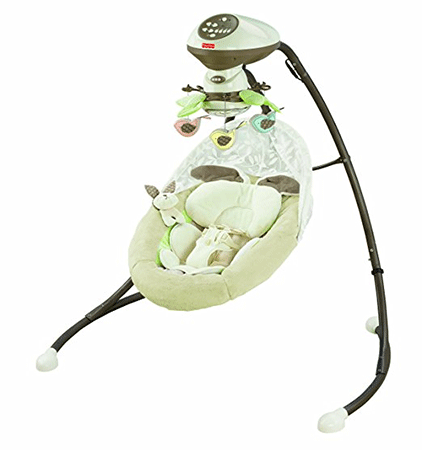 The comfortable Itsy Bitsy jungle swing comes in a loveable mini design that is packed with all the capabilities of a full-size swing. The 6-speed swing uses a weight-adapting technology to maintain its swing consistency even as the baby grows, making it the perfect childhood partner. It also comes with six original melodies and two playtime toys to keep your child thoroughly entertained. The seat can be adjusted to two comfortable positions to keep your baby happy. A 5-point harness and non-slip feet ensure that your baby is safe and secure when playing in the swing. It is foldable for easy transport and convenient storage. 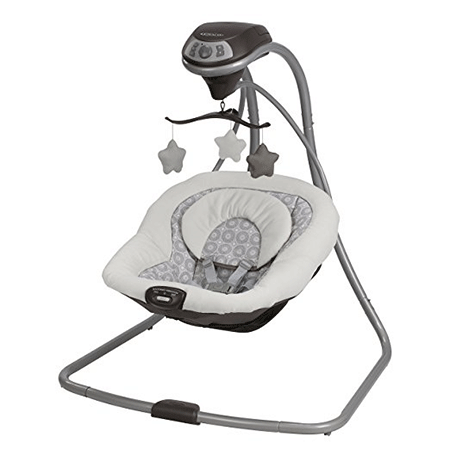 The Graco Glider Elite baby swing uses a gentle motion to soothe your baby to sleep. It is capable of keeping your baby occupied and happy for hours as you go about your duties around the house. The comfortable swing seat also doubles as a bouncer with a carry handle that allows you to take your baby with you around the house. The baby swing utilizes a space-saving design that makes it easy to store in any part of the house. It also features an innovative vibration technology that helps to put the baby to sleep. You can choose to connect it to an electrical outlet or use batteries for convenience. 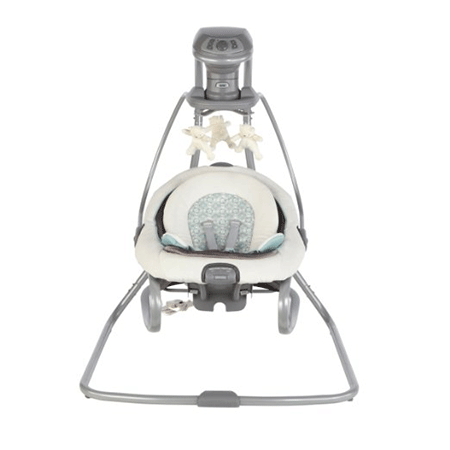 With its innovative design that features ten melodies and five nature sounds, the Graco Lite LX swing seat will keep your baby happy for hours. The versatile swing seat features a lightweight frame that is easy to move around the house in order to keep an eye on the baby. 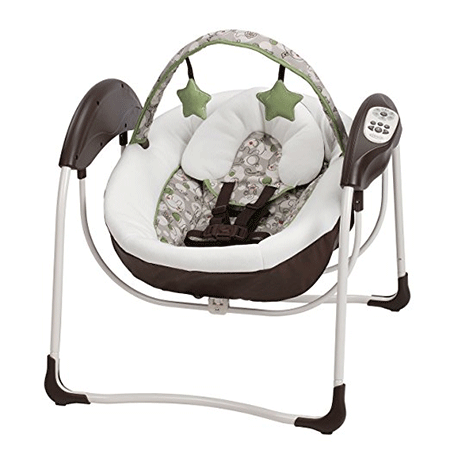 Its comfortable and roomy gliding seat soothes the baby to sleep with a gentle rocking motion. The swing seat comes with six gliding speeds that allow you to set a comfortable pace for your baby. The plush head support prevents aches and helps to keep the baby cozy all through. Featuring high-quality plush fabrics that are suitable for the baby’s sensitive skin, this swing seat provides premium comfort levels to your baby. It features a very comfortable Papasan-style seat that envelopes the baby in warmth and coziness. The swing seat also comes with two swinging motions, soothing sounds of the rainforest and is fully customizable to suit your baby’s likes. The main material of the swing is polyester built upon a plastic frame. In addition to the rainforest sounds, it comes with 8 soothing and 8 playful sounds to keep your baby entertained. It features smart swing technology with 6 gliding speeds and an AC adapter. This swing seat comes with a plug-in option that allows you to save on batteries. The swing uses a gentle sideways swaying motion to calm the baby and to rock them to sleep. It also comes with a 2-speed vibration feature that helps to soothe the baby further and get him/her to sleep. 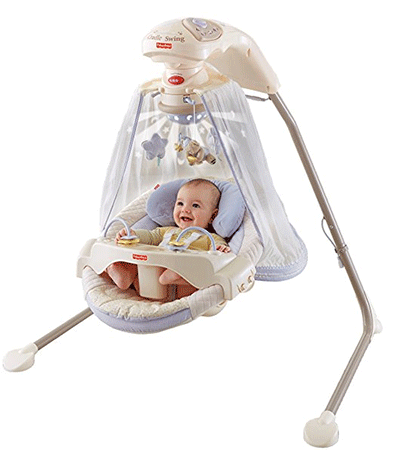 The baby swing features a plush, comfortable seat that surrounds the baby, making him warm and cozy. Its small, lightweight frame makes it able to fit into any space in your home and also makes it very easy to move around. It uses a 5-point harness to safely secure your baby. For the price of one, this item can be a wonderful swing for your baby to entertain himself/herself with that easily converts into a stationary baby seat with handles that you can use to move it around. The seat features Smart Swing technology that offers you six gliding speeds, twelve melodies, and sounds and calming vibrations to pacify your baby to sleep. The comfortable seat is deep and it envelopes the baby in a warm and cozy fashion. It also comes with two plush playtime toys to keep your baby entertained. This is a 2-in-1 baby swing that features a removable infant seat. 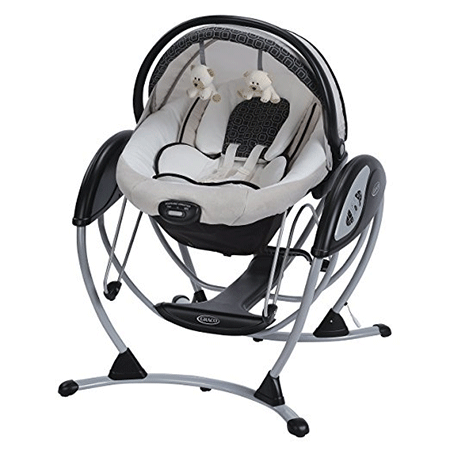 The rocker comes with three comfortable sitting positions that allow the baby to sway sideways or front to back. It has a carry handle that enables you to move it around easily. It also comes with a plug-in option that lets you save on batteries when indoors. The rocker uses a combination of smooth gliding motions, soothing vibrations with two-speed adjustment and melodies to keep your baby calm, relaxed and entertained. Featuring the innovative Smart Swing technology that provides more soothing motions, the Snugabunny Cradle n’ Swing provides ultimate comfort and entertainment to your baby. It comes with two restful swinging motions: side-to-side and the traditional head-to-toe swinging motion. In addition to that, it features sixteen melodies and relaxing nature sounds to calm the baby and help them sleep. The comfortable seat has an equally plush head support that makes it even cozier for the baby. The fabric of the seat is machine-washable for proper stain removal. It includes an AC plugging option to save on the 4D alkaline batteries when indoors. The deluxe seat is made of plush material specifically designed for sensitive baby skin. It features a foldable design that allows for easy storage and portability. 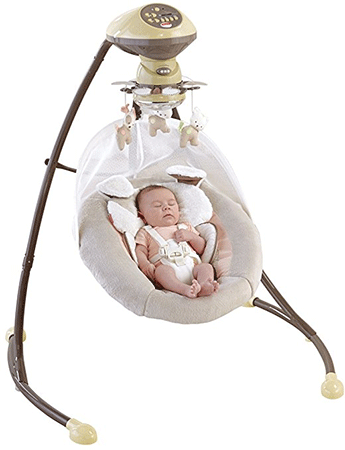 The cradle swing uses two different swinging motions to soothe the baby. It comes with a motorized mobile to keep the baby entertained as you go about your duties. It also features six swing speeds and Smart Swing technology, melodies, and natural sounds to placate the baby to sleep. It comes with an AC plug in option. 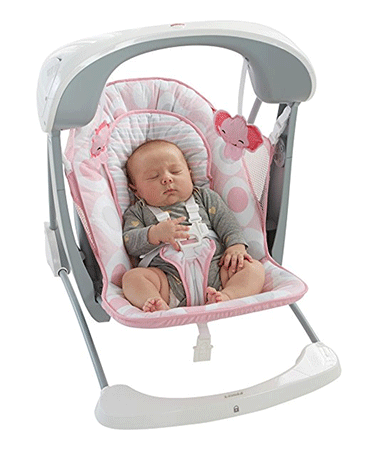 This cradle swing features a comfy, cozy seat that has two reclining positions for maximum comfort. It is supported by a 3-point restraint to ensure the safety of your baby. The cradle swing comes with a total of 16 songs to soothe and entertain. 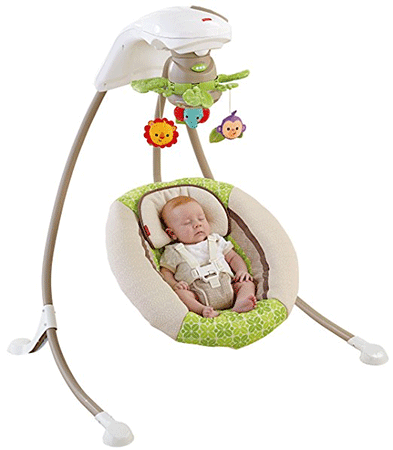 Its 6 swing speeds allow you to choose the right pace for the enjoyment of your baby. It also comes with a motorized mobile and attractive starry light that keeps your baby entertained and relaxed. The cradle swing allows for head-to-toe and side-to-side movement. An AC adaptor is included to help you save on battery.